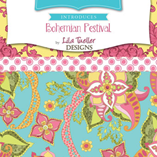 OMG how awesome is the new line from Riley Blake, Bohemian Festival. Check it out. My girls would love dresses in this!